Word 2016 offers the Index command for indexing a document (mark entries for the index and click the Insert Index button on the References tab). If you’re in a hurry, if you don’t have the time to mark index entries one by one in a document, you can mark index entries with another, simpler means. You can mark index entries by using a concordance file. A concordance file is a two-column table with words to look for in the document and their corresponding index entries. The words in the left-hand column of the table are the ones that Word 2016 searches for and marks for the index. 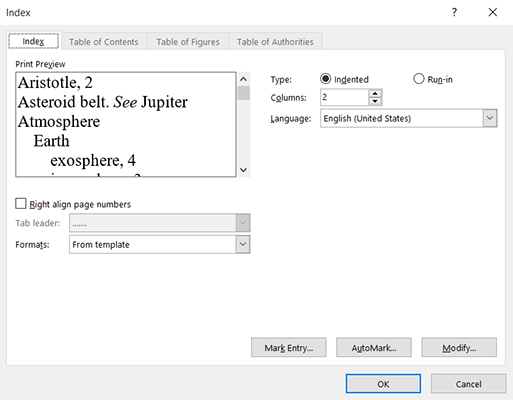 When Word 2016 finds a word that is listed in the left-hand column, it records the corresponding text in the right-hand column as the index entry along with the page number on which the word is found. With the concordance file method of indexing, you can’t include page ranges for entries or enter a cross-reference in your index. In a new Word 2016 document, create a two-column table. In the left-hand column, type text from your document that you want Word to mark for index entries. What you enter in the left-hand column is not the index entry itself — just the topic of the entry. For example, to make an index entry on Thomas Mann, type Mann in the left-hand column to tell Word to look for all occurrences of that name. To be indexed, words in your document must be exact matches of the words in the left-hand column. For example, if you type eagle steel works in the left-hand column of the concordance file table but the name is “Eagle Steel Works” (with each word capitalized) in your document, the topic won’t be indexed because Word won’t recognize it. In the right-hand column, type the index entries. For example, to create an index entry called “Mann, Thomas,” type Mann, Thomas. You can create subentries by using a colon (:). For example, to make “Mann, Thomas, early life” a subentry of “Mann, Thomas,” enter Mann, Thomas:early life. A fast way to create a concordance file is to open the document with the text you are indexing along with the concordance file On the View tab, click the Arrange All button to put both documents onscreen at once, and copy text from the document to the left-hand column of the concordance file. Save the concordance file when you finish entering the words and phrases to mark in the left-hand column and the index entries in the right-hand column. Your next step is to use the concordance file to mark index entries in your document. Open the document that needs an index. On the References tab, click the Insert Index button. The Index dialog box opens. Click the AutoMark button. You see the Open Index AutoMark File dialog box. To generate an index after you mark the index entries, place the cursor where you want the index to appear, go to the References tab, click the Insert Index button, and click OK in the Index dialog box.